When you practice tai chi and/or yoga, you begin to experience how sensitive your body actually is to the thoughts and emotions you are having. In tai chi, there is a move called ‘repulse the monkey’. This move requires total body balance as you kick with one leg, while balancing on the other, as you move slowly backwards. 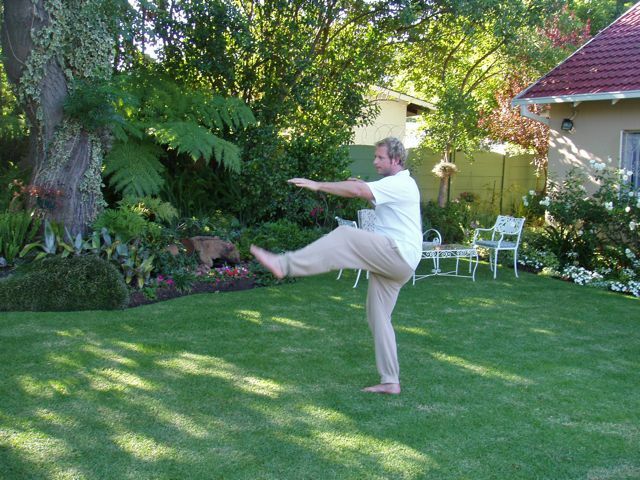 After the kick, this leg shifts backwards and needs to be placed slowly and softly on the ground in order to become the anchor and foundation of maintaining the body balance for the following kick. Once this occurs, the leg that held the body still and balanced gets released and now activates the next kick. And so on, as you move backwards, one kick unleashed after the next. In the early stages of my tai chi practice, I noticed that I was unable to maintain my body balance if I had things on my mind. This was exacerbated if I felt angry, sad or emotionally unsettled. This phenomenon never changed even when I had improved my competence level. My over-riding conclusion of this was that if you were to have perfect body balance, you had to be empty in the mind and peaceful in the heart at that given moment in time. Mind/body medicine research highlights the inter-connection between thoughts, emotionality (feelings) and the physical well being of a person. Prolonged destructive thoughts and ongoing negative feelings are likely to cause disease in the body. In simple terms, if you want to have a healthy body you need to have healthy thoughts and healthy feelings. While many of us may be aware of this concept (and believe it), the deep realization of what this actually means regarding how we should be living our lives needs to be closely examined. We need to understand the real power of our thoughts and feelings and how these impact on the body. I consulted with a ten-year-old girl who had been suffering from severe ‘heart burn’ for over six months. Her doctor had referred her to me after numerous medical tests had come back negative. Although medication was prescribed to reduce the acidity levels in the stomach the severe symptoms of discomfort in her chest region did not go away. In our first meeting, we spoke about her ‘burning heart’. I wanted to understand what had been causing her heart to burn since I view physical symptom as being a metaphoric reflection of one’s emotional state. The little girl spoke at length about the intense conflict that her parents were experiencing in their relationship and how this had hurt her heart. Her parents spoke about divorce as being a possible solution to the conflict. While speaking about this, she cried uncontrollably and placed her hands on her heart region. I suggested that she draw an image of her ‘heart burn’. She arrived at the next meeting with a large bright red heart that had been ripped and torn apart into two equal parts. There were tears dripping out of the broken heart. We spoke at length about the sadness that occurs in the heart when there is a break up of the family unit. She was close to both of her parents and loved them equally. The impending divorce was creating a situation where she felt that she may be forced to choose between them. She found this untenable. What amazed me about this little girl was that after three sessions her symptoms had completely disappeared. Once she had made sense of her heartburn in terms of the sadness that she was experiencing in the family there was relief in the symptoms. It was as if her body had passed on its message to her mind and this message had now been acknowledged and listened to.